Who can say no to leather wallets? No matter it’s PU leather or the genuine, each kind of material all delivers a specific texture, experience and beauty. Not saying that, if you are understandable enough to grab a good one, it will serve you for years. Leather wallets, they’re only getting better with time! 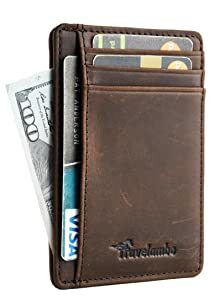 In this article, I will dig deeply into different kinds of best leather wallets to ensure that at least one of them will meet your taste. Now, let’s get started! 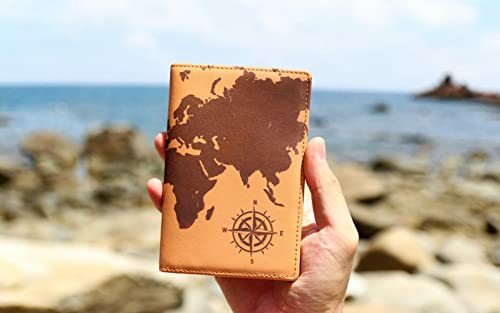 Most of us rarely have the opportunity to travel abroad or go on a business trip, so, it’s a worthy investment on your travel belongings such as a cool yet functional passport wallet. It doesn’t cost much and even, you can receive more benefits than what you bargained for. Aside from a character piece to have better Instagram photos, a good passport wallet can keep not only your passport security, but also your other belongings such as currencies, cards, flight ticket and boarding pass. 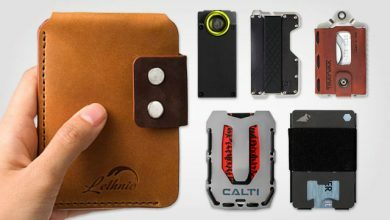 If you love something neat and can stay in your back pocket when your hands are busy, this Lethnic Leather Wallet is your best bet. Its design is very compact and intuitive to come in a perfect compromise of functionality and slim silhouette. But first, let’s look at its leather texture. 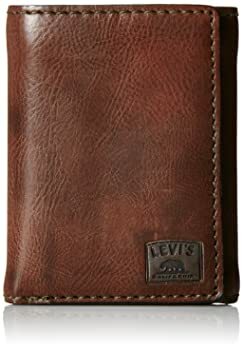 The entire wallet is made out of high-quality genuine cowhide leather to bring an incredibly soft and smooth feeling touch. Particularly, its surface is beautifully engraved with some special and meaningful image like the World Map, the Statue of Liberty, the Tree of Life, the United State Symbol. There are a lot of designs and colors to go to by the way. Just take note that, because the leather surface is burnt by laser to deliver sharp cut and nice engraving, its smell won’t be the same as other genuine leather wallet. Might be a bit weird, but luckily, it’s not bold. Going inside, you will be amazed by how streamline and well-organized it will be. Aside from a separate compartment for passport, there are five card slots, three bill compartments and especially, one tiny slot for SIM card or memory card. I really appreciate this detail because when traveling abroad, you must use that country SIM card and the old one, you need to store it carefully to re-use when you come back to your country. If it’s lost, I bet there must be a lot of annoying related stuff after that. So, thanks to this detail, you won’t be confused of this issue anymore. For something with staying of classic and minimal, you will fall in love with this genuine cowhide leather wallet from Travelambo. Its nicely embossed brand name in the front matching perfectly with its simple design, delivering an elegant and exquisite look. Not saying that, the wallet comes up with a beautifully squared packaging, which I think you can make advantage of this for an ideal present box. As this wallet is designed to slim, it will be a perfect companion for those who love carrying less. It fits neatly your daily essentials with 3 card slots, 1 ID window, 2 flips and 1 middle cash pocket. I will emphasize again that it’s interior is not as spacious as a bifold. But this wallet still enables to fit up 5-8 cards, and some folded cash. The built-in RFID Blocking Technology can prevent any frequency in 13.56 MHz, keeping your personal information against hi-tech thieves. Besides, its one-year warranty and the diverse color scheme will surely get a yes from you. Need something that’s still feel current in the next ten years? 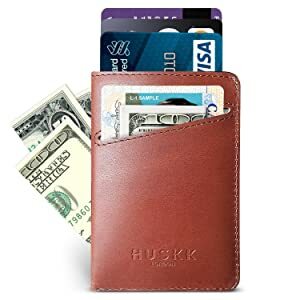 Don’t miss out this HUSKK Wallet. Its 100% top-grain leather will let you experience how durable, timeless and flexible of real leather. Besides, its colorway is pretty eye-catching though they are all in dark tones. It’s a perfect compromise of young yet classic look and vintage yet powerful feeling. Despite its 2.4 x 2.4 x 3.9-inch size, each detail and compartment all give us a specific benefit and convenience. For example, the slash in its front pocket and smart pull tab in the major card pocket. They all allow us to quickly access our regular cards when in a hurry. Though it comes up with simpler construction than other slim wallets, (just three compartments) each of them is spacious enough to fit up 2-4 cards. You can utilize one of them for cash storage due to preference. Plus, RFID Shield and the money back guarantee from HUSKK make it persuasive to try. Believe it or not, this wallet is 100% made out of precious Italian cowhide leather. But through some leather treatment, plus the zig zag embossing as well as camouflage pattern on its surface, it looks more sturdier, canvas-alike and masculine. With that grungy and military vibe, this tactical minimalist wallet is perfect for minimal people who love sporty style. 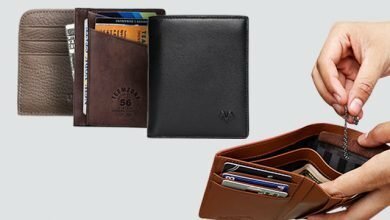 Though the whole wallet just has three compartments, each is designed to provide moderate storage space and standard dimensions to fit various sizes of cards. But overall, its capacity is up to 10 cards and 15 folded bills without a burden. 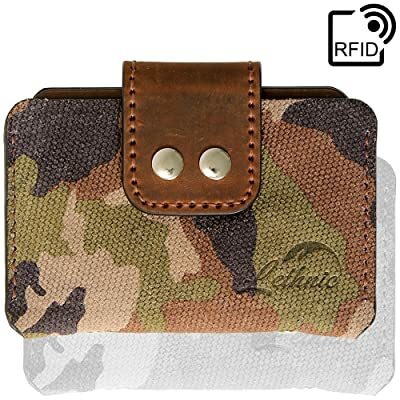 And like any other Lethnic’s wallets, it’s attached with advanced RFID Blocking Technology that can prevent all 13.56 MHz Frequency. Thinking it as a meaningful present for your friends or loved ones is also a good idea because not only it comes in a nice packaging, but also a reliable 30-day warranty that covers any detects from manufacturing process. Though it’s a small detail, but a name card holder case can partly show your personality and even how professional you are, especially for businessmen. Invest on a good card case is a good investment. And you can consider this UBAYMAX. It is made from high-quality, soft PU leather and that helps a lot in cutting off the cost as well as make the maintenance a lot easier. Despite the manmade material, its surface features nicely natural wrinkles on the surface, delivering a whole classic and luxurious look. As this is a leather card wallet, its figure is squared and eye-catching. 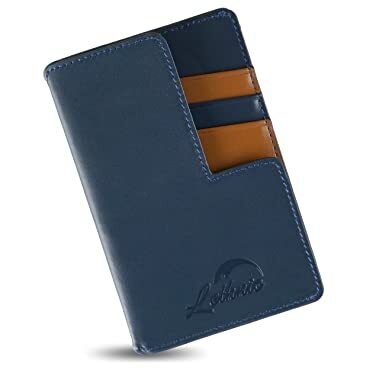 Measured by 3.74″ L x 1.47″ W x 0.51″ H, the wallet can fit up 25 name cards which is an enough number for business engagements without bulk in your trouser or jacket pockets. It only features only one compartment, but don’t fret, your name cards won’t fall out as its powerful magnetic snap will keep the whole wallet shut closely. Coming off an affordable price, as well, I think this is a worth invest. Can’t deny that the recent products from Lethnic are more and more creative and distinctive while still excelling its functionality. 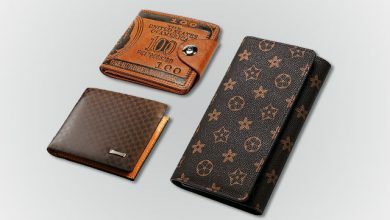 Like this L-shaped wallet, don’t think that this front stylized flap is a decorative detail. You can take advantage of this as an extra storage space to put in some more receipts or bills. Besides, I’m a bit in love with its contrasting color combination of the front card slots, which is pretty outstanding. Flip to the backside, there are two more slots for your regular cards and IDs. Lastly, one middle compartment that’s designed perfectly to fit 10-12 folded bills without a burden. 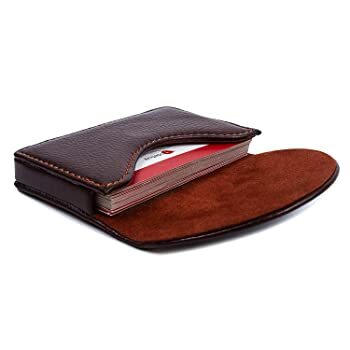 In generally, this wallet can accommodate up to 7 cards and a couple of changes, which is ideal for minimal individuals. Again, its RFID Shield is another great bonus for the ultimate protection. With it, feel free to keep those annoying identity thieves at bay. Made out of 100% high-quality cowhide leather, its softness and smoothness, plus the tight stitching and strong seams absolutely ensure that it will serve you for years. The more you use, the softer the leather texture is. I’m quite sure that you will love it. We all know that crocodile genuine leather is luxurious and expensive that not all of us are ready to spend our money on. Don’t be upset, as there’s another tricky way for you. 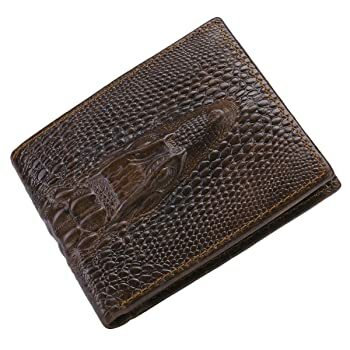 Itslife Cowhide Genuine Leather Wallet with Alligator Embossing. It’s like killing two birds with one stone. 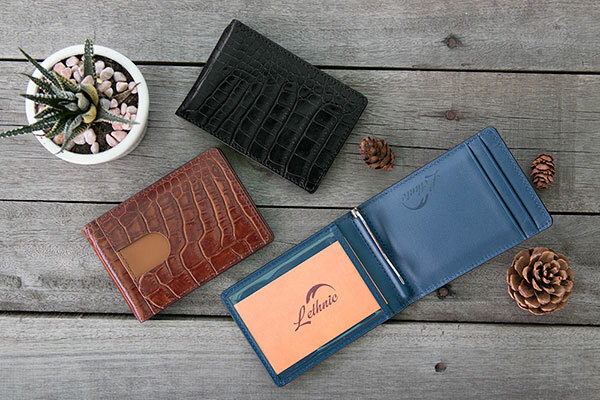 You will get a wallet containing all features of genuine leather but with nicely crocodile embossing on the surface. On top of that, its price tag is much cheaper. This Itslife Wallet is made from the top grain leather with oiled tan to deliver a light shine, luxe, softness and durability. If you want to stay more unique and badass from others, just try different designs. Apart from the back and brown crocodile embossed, there are three more versions: the tiger and the dragon with one of a kind outlook. Featured as a long bifold wallet, measured by 7.28 x 3.54 x 0.787 inches, this wallet delivers superb space for storage, including 11 card slots, 2 interlayers, 2 bill slots, 1 ID window and 1 zippered pocket. It can fit up many stuff like cash, cards, checkbook, passport, driver license, coin and receipts. Everything will be streamlined in this wonderful item. If your budget is on the table, give this Authentic M Crocodile Skin a try. It is crafted from genuine freshwater crocodile backbone skin, giving a smooth texture and striking durability. You can even feel the ridges when touching its surface. If taking a closer look, you will see its strong stitching and good lining as well. 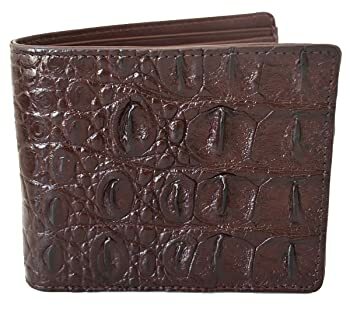 In other words, this is a quality alligator wallet that is worth every penny. For those who are wondering about its set-up, there are 10 card slots, 2 clear ID windows, and 2 full-length compartments to streamline your cash, bills and receipts. 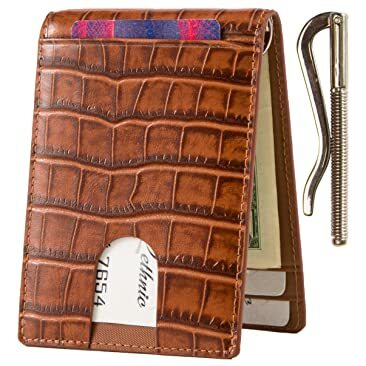 Featured as a compact bifold crocodile wallet, its measurements are 5.3 x 4.8 x 1.2 inches, which stays neatly in back pocket or jacket pocket. A treasure of a snake! 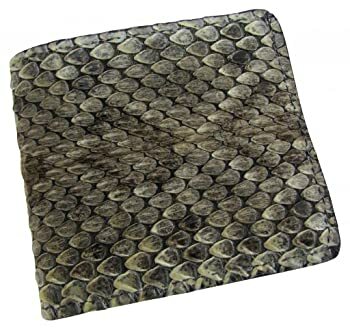 This USA-made Top-grain snakeskin wallet has vibrant hues of grey and black scute throughout with cowhide leather backed. It’s luxurious, indescribable enough to make you stand out from the crowd and show up your vibe. It has 6 card slots, 2 flips, and 1 large compartment, each of which is stitched tightly and evenly plus the thick lining. You can easily see it when taking a closer look. Its durability and sturdiness aren’t something jokey. For sure, this will be a precious and meaningful present for your family and friends on some special occasions. 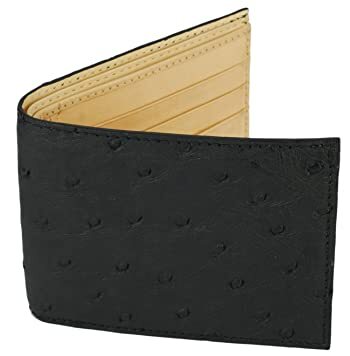 If ostrich leather with distinctive pattern of bumps is your taste, just go for this Tom Barrington ostrich wallet. Its outer performance is full of vacant quill follicles, but the general surface is superbly smooth and flexible. For those who don’t know, ostrich leather is one of the most luxurious material in tanned leather industry because to get such aesthetic value, the ostrich skin has been through many expensive and specialized process. To that end, it’s both perfect if whether it’s bought for your family or yourself. Another good thing about this precious wallet is its double cash compartments in which you can streamline your bills/receipts/cash neatly while keeping them straight. Apart from 6 card slots, 2 hidden pockets, there is also a flip-up ID window for your identity cards or driver license. Not saying that, there are three color options to choose: blue, red and cream. I bet that crocodile leather is the dream of many leather product collectors because of its well-known premium quality and texture. But along with that, its price is luxurious enough to break anyone’s bank. If you are on the same boat as me, you’ll definitely love this product. It’s made out of 100% high-quality cowhide leather to ensure the distinctively soft and smooth texture. But the best thing is its super sophisticated alligator embossing. This leather treatment upends the luxe of this wallet up to many times and it’s perfect for businessmen, office workers or those who follow the luxurious and elegant style. In terms of capacity and construction, this model includes 2 card slots, 1 ID window and 1 stainless-steel money clip. Besides, there is one more slot on the outer side for your regular cards and this storage space can accommodate up to 2-3 ones. Plus, it has a wise thumb strap for easy access. Particularly, with this design, the ID window is ensured the best security under the RFID Blocking Technology. There’s just one thing you should take note of the front card slot, due to its thumb strap, you shouldn’t let your card’s RFID chip exposed through this space to ensure the ultimate protection. Of all exotic leathers, the stingray is arguably one of the supplest and the most durable. In comparison with the cowhide leather, it is 25 times more durable. Amazing, right? Moreover, its texture is truly one of a kind, including thousands of smooth tiny pearls throughout the surface, and coming up with various colors. Like this Nina Carole Designs Stingray Wallet, it’s a combination between black and white beautifully. It features a vertical trifold silhouette with 6 card slots, 2 multifunction pockets, 1 ID window and 1 long top compartment. Not saying that there is an external slip pocket for quick access your regular cards or cash. One of my favorite trifold wallets ! At first, I though the cash compartment is narrow and tight, but I was wrong. It’s quite spacious and roomy enough to fit up any sizes of currency and a large number of bills as well. Recently, eel skin has become of the most favorite skin leather in European high fashion because of its fabric-like quality. Though this is not a luxury material, its unique texture will make you more stylish, chic and fashionable. In terms of quality, eel skin is considered as the most flexible material that when hands on, you can feel its luxe through the extraordinary softness and bendability without making creases. Thus, if you are a person who tend to carry more, don’t fret if you decide to opt for an eel skin wallet. No matter how fulfilled the wallet is, it still has some more room for stuff without being torn. 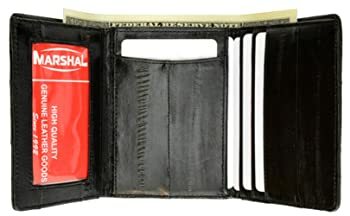 Not saying that, this Marshal wallet features a trifold silhouette, which means there is even more space for storage. Levi’s fan, raise your hands up! This trifold genuine leather wallet marries a classic aesthetic with nicely brand logo embossed on the outer frontside. It is crafted from high-quality genuine cowhide leather, still keeps the natural wrinkles on the surface and is sure to make a smile on your face. This brown leather wallet is well-made with strong stitching and manmade lining. Plus, it’s striking slim despite the trifold silhouette. With 3.5″ wide and 4.25″ high, it can fit up either your back pocket or jacket pocket neatly without burden. Besides, its well-organized interior will surely keep your stuff streamlined better than ever even on a move. 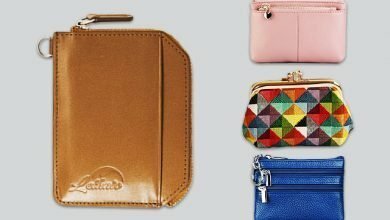 Finally, remember to pin these best leather wallets showing up your one-of-a-kind fashion style while being fashionable.